A project made possible in part by a special friendship and contribution from the Providence Forum and Rob Westman. This book was created with a vision by Westman to make the story of George Washington, his faith and values accessible to every child. At the Providence Forum, we are pleased to partner with Rob’s vision of George Washington Providence to create this beautiful and educational tool for families, budding patriots and future historians alike. George Washington PROVIDENCE is a book that persuasively captures how the hand of Providence shaped George Washington’s private and public life. His vision for freedom, his principles of leadership and his heroism are presented on a level for families and children of all ages. It’s impossible not to be inspired by God’s fingerprints in human history, and Washington was a man intended by Providence to live a fascinating life filled with integrity, self-discipline, repentance and duty. George Washington PROVIDENCE carefully and accurately captures the great themes in Washington’s life that still touch all of us today. Beautifully illustrated, each page is a delightful lesson about his legacy of faith. Washington acknowledged his faith in God when he wrote a letter to William Gordon, May 13, 1776. He said, “No man has a more perfect reliance on the All-Wise, and powerful dispensations of the Supreme Being than I have, nor thinks His aid more necessary.” The book also includes an extensive 11-page bibliography, and serves as a terrific resource for children to use for their own homework and research projects. George Washington PROVIDENCE is a keepsake treasure for every American. 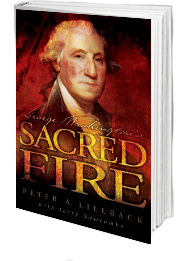 History enthusiast, Rob Westman, was inspired to write George Washington Providence after reading the national bestseller entitled George Washington’s Sacred Fire written by our own Dr. Peter Lillback and Dr. Jerry Newcombe. His mission was simple: to write a children’s book inspired by the religious faith of George Washington himself. Once his first draft was completed, Westman sent a copy to Peter Lillback at Providence Forum hoping for some feedback and a Providential partnership was born. What is essentially a children’s version of Sacred Fire, Providence Forum saw fit to publish the book and help get it into the hands of budding historians everywhere! From there, the Westman visited Philadelphia and Mt. Vernon to develop his research and enhance the story of Washington Providence. Westman, a videographer by day, also produced a documentary film on George Washington in 2014 and recieved a Telly Award for his film work in 2003. Rob lives in Texas with his wife, Lanie and is the father of two grown sons. Kay Walton is a full time artist who creates paintings of distinction. She is well known for her extraordinary bluebonnet paintings as she is continually inspired by the beautiful hill country of Texas landscapes. She is a native Texan with a strong connection to the natural beauty of the state. A professional painter of 30 years, she created over 20 exquisite oil paintings for this project – a true labor of love which took her more than five years to complete.